Good news is that this is NOT the reality for all guitar teachers. After teaching and training guitar teachers to become successful for several years now, I have seen just how simple it is for anyone to earn a lot of money (at least $100k per year) teaching guitar. Guitar teaching business owners do not fail because it is too hard to succeed, they fail because they have the wrong mindset. The vast majority of guitar teachers have a pessimistic view of life that makes it impossible to reach success. In this article I will show you how dangerous this mindset is for your teaching career, but before continuing, take this free assessment and find out how close you are to big success as a guitar teacher. 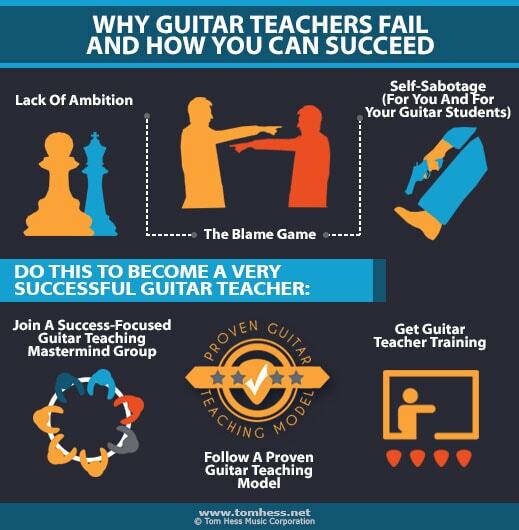 The following are the common reasons why most guitar teachers' mindsets cause them to fail and how you can prevent this in order to achieve big success in your teaching business. Truth is, the most successful guitar teachers systematically attract guitar students all year long, in any place of the world, with or without great credentials. In reality, the only credential that really counts is the level of training you have for effectively teaching guitar. The good news is: this credential is easily acquired and you can get it whenever you want and you do not have to spend (waste) thousands of dollars and many years like you would with any traditional music degree. They have been around negative people for their entire life. People who taught them things as: “making huge amounts of money isn’t possible for a guitar teacher” or even worse “Attempting to make money with a teaching business is a waste of time and you ought to not even try it”. They worry about their own ability to reach success. They have never met anyone who has made lots of money with a guitar teaching business. This negative mindset that most guitar teachers have keeps them from ever doing anything to become successful. This negative mindset will prevent you from making big money and will also hold your guitar students’ progress back as well. Want to know why? 1. Because you lack commitment to becoming a truly great guitar teacher, you won’t do what you need to do in order to succeed. 2. Your students will notice your weak conviction and will never take you seriously. Your negative mindset spreads to your students’ mindset, causing them to doubt their own true potential. This will create a very bad reputation for you in your town and local area where the most committed guitar students, the ones that do have the money to spend on guitar lessons, will stay away from taking lessons with you. 1. Get In Touch With An Outstanding Guitar Teacher Training Group: What this means is find and hang out with guitar teachers who have already achieved an extraordinary level of success or are on their way to making 6-figures per year with their guitar teaching business. Beware: the vast majority of online teaching forums are filled with unsuccessful and pessimistic teachers who do not have a high standard for success � you must avoid them at all costs. Alternatively, find and hang out with guitar teachers that have achieved real success in their local areas. Success coach Tony Robbins has said “Your level of success will be in direct proportion with the people you surround yourself with”. This applies for guitar teachers too. Cynics will often tear you down with their negative mindset, but at the same time, successful guitar teachers will inspire you and encourage you to become even more successful than them... that's how successful people think. 2. Use A Proven Guitar Teaching Model: When you have surrounded yourself with the best and most successful guitar teachers, do exactly as they have done: get a master plan for your guitar teaching business success. This means: get the training, support system and tools to build a successful teaching business. When you have all this in place, success will become automatic for you. Beware: In order to get the best possible outcome from these steps, you need to get rid of all sorts of cynical beliefs that might dwell in your mind and align it with the same mental attitude that the world's top teachers have. To do this, take this free assessment: “will you become a successful guitar teacher?” and get free feedback from me on your progress towards building a successful teaching business.